I’ll preface this by saying I’m not typically one to believe in the “everything happens for a reason” mantra. My journey to ABT however, can only be explained as such. Being from the DC metro area, I had first applied for a marketing internship with The Washington Ballet. I had my interview – my first interview ever – and didn’t feel so great about it so I started researching and applying for internships with practically any east coast ballet company that offered one. I applied to ABT and frankly, really didn’t expect anything to come of it – it felt too out of reach. I had first heard of the ABT internship program a few years prior through a girl who I had attended a previous summer intensive program with who, during her freshman or sophomore year at Duke, interned at ABT. Having just ended my dancing “career”, and having just started my freshman year of college as an arts administration major, I knew that at some point in the future, I wanted to apply. The time at which I applied for the internship however, did not feel like the “right” time. Low and behold, about three weeks or so later, I heard back from Washington Ballet that they had decided to go with someone else. The literal next day, I got an email from ABT asking to schedule an interview and for some reason, it then started to feel “right”, I had a good feeling about it for lack of a better explanation. About a week or so later I got a call offering me the position and having told my mother, who I knew would first object due to the cost of living in NYC, that if I got it I was going whether I had to take out loans to pay for it myself or not, I accepted on the spot. Two weeks or so from then I was in New York apartment hunting with only a little over a week to go before my move in date. Upon signing the lease for a large walk-in closet sized apartment in Manhattan for an absurd price, I returned home eager for my first day at 890 Broadway. It seemed like it took months for this day to come but when it did, I instantly knew I would be happy here. First, as a former dancer, it was just an honor to be in the same building as some of the dancers I had admired for years, more less passing them in the hallways. Second, hearing the music from class and rehearsal made me feel like home and made working so much more enjoyable. Third, everyone in the office was so friendly and welcoming. My first impression held true throughout the three months. I have loved every minutes of working here and only wish I were here longer. The membership department operates a bit as a family, all the love, dysfunction, and fun included. Although when I applied I listed membership as my second choice, I truly believe that in the end it was the right department for me. The work I did in the membership department ranged from working events, to entering data, to stuffing envelopes. The range of work allowed me to develop a diverse set of skills that I’m not sure another department would have allowed for. Having gone into my internship with a specific interest in event planning, it came as no surprise that my favorite part of the job was getting to work the member events. As an extremely calm person, almost to a fault, it’s easy for me to remain calm in stressful and fast paced situations and I strangely enjoy the chaos of last minute setting up and running around to prepare. Then, working the actual event generally means there is some degree of participation, either through engaging in conversation at a cocktail party or watching a rehearsal during a studio visit, which I very much enjoyed. Although not technically a member event, working fall gala was one of the highlights of the last three months. First, people watching as people entered the theatre was what I believe to be one of the greatest people watching spots in New York that night. Second, upon finishing our duties of directing people up to the gala dinner, we were able to attend the gala with our own little table on the second tier – the perfect spot to do some more aerial view people watching. After dinner, a few of us went down to the dance floor and danced the night away in our formal dresses. It was quite a night and one that I’ll never forget. A second highlight of my time here was the annual holiday staff party. It was great to be able to mingle with everyone from every department, including the dancers, together. An awesome beach volleyball court had been set up in one of the studios and a lot of us from the membership department along with a few dancers, a few people from other departments and later on a group of JKO kids, played volleyball all night long. It was quite a laugh and so much fun. It was a great way to have some fun and to get a chance to hang out with everyone outside of work before the end of my internship. In short, I loved practically every minute of being a membership intern at ABT. I had a great experience working for one of the top companies in the world and it was a true honor to get to play a part in the inner workings of it. Before coming to American Ballet Theatre, I had no idea what to expect. I was nervous because it would my first experience with ballet, my first internship, my first time being in New York, and my first time living on my own. In spite of my concerns, I chose to come to participate in the internship anyway, which I can now say was one of the best decisions I have made in my life. This summer I had the opportunity to serve as an intern in the Membership Department. This particular department is one of the most important parts of the American Ballet Theatre’s Development Department. 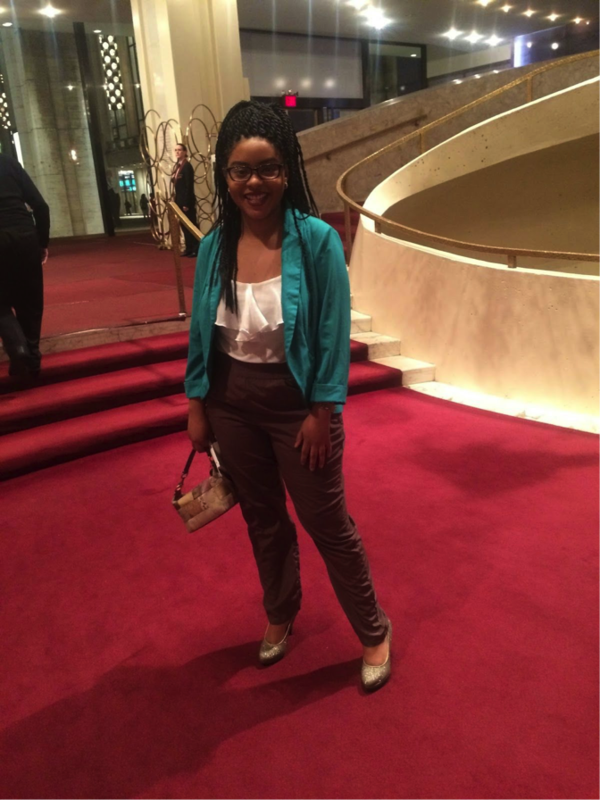 I started my internship in the middle of the spring season at the Metropolitan Opera House. During this time, the Membership Department is usually in a frenzy day in and day out. Starting my internship in the middle of the season forced me to learn and adapt quickly. Even though the pace of the work was intense, the peaceful atmosphere of the office never allowed me to feel stressed. The Membership Department is responsible for recruiting and retaining the members who “make ABT happen.”In order to try to recruit new members, some nights during the spring season, I worked at the Membership table, a table set up at the Metropolitan Opera House. While at this table I made it a point to interact with the audience before and after each performance and during intermissions. I engaged the audience members by passing out pamphlets, answering questions explaining how membership at ABT works, and by simply asking them about their feelings about the performance. It feels great being able to say that I helped 3 people become members while doing this! In order to help retain the pre­existing members, mailings are sent out monthly in order to remind those whose memberships are expiring to renew. Unfortunately, these mailings are usually very large and create papercuts to match. However, each member who renews their membership makes it worth it! Members receive a special set of benefits that can include personal ticketing services and invitations to private events. During the spring season, patron ticketing is hectic. Each day there are numerous calls with single ticket orders, subscription exchanges, and other ticket exchanges. This particular area of the department is very demanding and things can pile up extremely quickly. However, when it is all done and you managed to squeeze that last order in before the messenger got too irritated, you are left with an amazing feeling of accomplishment. After the spring season is over, everything in the office seems to come to a screeching halt. The cloud of intense urgency that hangs over everyone’s heads seems to fade away and everyone is left with the most beautiful smiles and hearty laughs. Everyday there was a new reason to celebrate and we celebrated indeed. We celebrated with dance­o­clock, chocolate, the best homemade baked goods in New York, and more chocolate. Overall, my favorite part of the internship was the atmosphere in the office. Everyone works well together and genuinely tries to make sure that each employee in the office has whatever they need to make it through the day. If you’re ever in the membership office, you’ll hear the word the family a lot and after being there this summer I truly see why. While dysfunctional at best, ABT truly is one large caring family and I’m extremely grateful to say I got the chance to be a part of it. Throughout my time at ABT, I have made a great friend at work–Pat. Although we did not get along at first and someone had to teach us how to work together, we eventually became close friends. Mailing is constant here at ABT, and I had to work with Pat often. He can do amazing things! He can seal your envelopes and he knows how to pull the letters through a conveyor belt to postmark them. You can easily send something to another country by selecting an international letter on his program. Though he makes life easier, he can also decide to act up. He will stop working and say he has to “warm up.” Or, he holds onto a letter and will not let go until you yank it away from him. We will be working on a large project, and then he decides that he does not have the funds to finish and stops working. Of course, all the problems are resolved with the help of someone else or just taking a moment and revisiting the issue later. Simply restarting has fixed many of our problems. All in all, we had some good times together. Pat, if you have not have guessed, is our postage machine. It may seem weird to write about a mail machine’s importance, but around the development office, we would be lost without it. Huge mailings are sent out before large events, including member ticketing privileges. Whenever donations are received, donors receive letters in the mail explaining their membership or thanking them for their gift. During our performance seasons, we send out a lot of information, such as dress rehearsal tickets. In general, the department’s primary form of communication relies on ground mail. Without Pat, the development office would have a much harder time sending important information to donors (and we would have to lick a lot of envelopes!). The holiday season is a time of stress and joy. People attend a different party every night, while frantically scurrying around trying to find that perfect something. ABT’s Met season could be seen in a similar light. The company has a different performance each week, and people are constantly trying to figure out which show they want to see. It is a busy time, but there is always something new to do. The Development office ensures that members have great benefits and feel as if they are a part of the company. Throughout the Met season (or any season, for that matter), the development office works around the clock. Seeing how ABT functions throughout one of its busiest seasons is like watching a well-oiled machine run. Everyone has their part-–ticketing processing, member events, database upkeep, and member acknowledgements. As an intern, I have been able to assist with every aspect of the department, including member events. I enjoy learning about the company and how the development office functions, but I truly love assisting with the events themselves. ABT membership comes with different benefits at each level. At one level, a member can receive two passes to a dress rehearsal and the bi-annual company magazine On Point. When on a higher ring of membership, a person can attend multiple dress rehearsals, go on backstage tours, and watch a dancer interview, plus many other amazing opportunities. The development office plans all the membership events throughout the seasons. They coordinate each event with the Met, other venues, and company managers to achieve a spectacular evening that may only last 50 minutes. Like the holidays, the planning takes place months in advance, but work continues up until the party starts. Let’s take for example, a dress rehearsal. Company managers and the development office discuss dress rehearsal dates long before the Met season begins. Members receive invitations to dress rehearsals and decide which ones they wish to attend. A few weeks before the rehearsal, the box office sends the development staff tickets, and the staff sends them to members attending the rehearsal. Work starts early in the morning for each event. Each dress rehearsal has its own individual program, but cannot be finished until the day of, which is when the department receives the dress rehearsal cast. Multiple departments must then review the program for information accuracy and conformity to ABT’s style guide. Our staff prints and folds anywhere from 500 to over 1,500 programs that morning, and then delivers them to the ushers when they arrive at the Met. While at the Met, the staff works to ensure that donors have tickets and that no question goes unanswered. Needless to say, each event takes a lot of time, double checking, and manpower. The entire department must communicate and work together to execute each event. The Met season takes a lot of hard work from everyone involved, but it is a truly spectacular time of the year. Each performance is unique and exciting, and the entire season is a joy to be a part of. One of the most interesting aspects of being an American Ballet Theatre intern in the membership department is actually interacting with the donors during the Met Season. Through special events such as the Golden Circle Luncheon and by working at the membership table, I really had the chance to gain some perspective on how a non-profit arts organization actually works. It is amazing to see how the membership and development departments care so much about all the donors, and how they work so many hours during the season to see that patrons at every level are able to enjoy the beautiful ballets and all the benefits that come with membership. Developing actual relationships with the donors gave me a glimpse into the real work that the membership department does. By meeting and talking to all the patrons during my time at the Met, I could see that they all really care about ABT and about the art of ballet itself. The Golden Circle Luncheon, held in honor of Mr. Brian J. Heidtke, was one of the most unique and interesting events to help out as a membership intern. The luncheon is held annually for ABT’s Golden Circle members, who are crucial to the company. The planning that went into the event was immense but rewarding. From mailing tickets, invitations and acknowledgements, to creating, printing, and folding programs, there was a lot to be done in preparation for the event. At The Plaza Hotel, we began our day bright and early, setting all the gift bags, programs, and place cards at each table and getting ready for the guests to start arriving to check-in. The event moved smoothly from The Plaza to the Met for the dress rehearsal. It was amazing to see how an event of that caliber was prepared for and run in such a smooth fashion. Again, it just reminded of how the membership department works tirelessly for all the patrons to honor and thank them for their incredible support to the company. Working at ABT this summer has been such a gratifying experience and I am so thankful for the opportunity! Why Do People Become Donors? I come from a country where the structure to sustain the arts is not based on philanthropic donations; so one of my priorities for my first internship in the U.S. was to gain a hands on experience in a an arts organization where I could feel inspired by what they do, and where I could understand what makes people become donors and/or members. There was no better option than American Ballet Theatre to learn about it! By interning at the Membership Department I learned that people can join the organization starting with only $75 a year–-about 20 cents per day–and every level of donation gets specific benefits such as dress rehearsals, studios visits, letters, magazine and season information in advance. ABT offers two different categories for ballet goers: subscription and the membership. The subscription relates only to tickets, as people get discounts for purchasing in advance a package of tickets, ensuring themselves great seating even before the general public tickets go on sale. In this category there are series of 3, 4, and 5 performances, as well as series for families and special events. The second category is Membership where people give donations in exchange for benefits. This is highly recommended for ballet lovers! From my previous experience, people who help sustain arts organizations often look for something in exchange for their support. From my time at American Ballet Theatre, I realized that people donate and become members because they care for the mission of the organization and they trust in the high quality art form that is being represented and the belief of a shared responsibility of supporting the arts. This support is critical for all arts organizations. The organization draws members in and keeps them interested by preparing different kind of events such as studios visits, sneak peaks, classes, and seminars. Other kinds of efforts are also coordinated with different departments to send subscriptions guides, brochures, calendars, and invites. Lastly, as part of this amazing experience, I had the chance to help with the database where all the member’s information is gathered. That allowed me to better understand how the organization classifies members, donors, and subscribers by their preferences, seats, and performances among other options. It has been an interesting journey at ABT where I have started learning how one of the best ballet organizations in the world prepares their “behind the scenes” process. Thanks American Ballet Theatre for this amazing experience. One of the goals of the development department at American Ballet Theatre is to widen the circle of patrons who support the company through yearly donations. One of the ways that ABT has tried to recruit new members is by having a membership table set up at the Metropolitan Opera House during its eight week Spring Season there. As one of the membership interns I’ve had the opportunity to work at this table during the past few weeks and it has quickly turned into one of the highlights of my wonderful internship experience! During the weeks leading up to the Spring Season a sign-up sheet for the different staffing needs at the Met goes up in “Devo Hall”, where most of the members of the development department work. I was quick to sign up for most of the nights, knowing that working at the Metropolitan Opera House is not an opportunity that presents itself very often. On the nights when I’m working at the membership table I get to the Met about an hour and a half before show time so that the table is all set up when the house opens to guests half an hour before the show. This means that I get to come and go through the stage door, which is, admittedly, one of my favorite parts. Up at the Grand Tier level we have a large table set up in front of the staircase and a smaller kiosk in front of the Met’s patron lounge called the Belmont Room. Both of the tables get set up with membership materials, but the larger table gets most of the bells and whistles—it’s packed with membership incentives to catch the eyes of passersby. We have a drawing for a chance to win a pair of tickets to the fall season at the Koch Theater, a laptop playing one of ABT’s DVDs and a poster covered in signed photographs of the dancers to lure people in. The table also has membership brochures, Junior Council brochures (a special membership category for those aged 21-40), and copies of On Point, ABT’s magazine that comes twice a year with membership. Once we’ve got someone’s attention with a signed photo of Misty Copeland or a clip of Baryshnikov in Don Quixote it’s our job to engage them and talk to him or her about the benefits of membership. Most of the time, it’s just starting a conversation about whatever caught his or her eye—“Oh, that’s our magazine. Feel free to take a look. It comes to you twice a year if you become a member!” Membership starts at the $75 “Friend” level and you get to attend a working dress rehearsal at the Met so it’s hardly difficult to entice people. What’s more, if you become at “Friend” at the membership table you can take home a ballet DVD and if you become a member at the “Contributor” level you get to take home a signed dancer photo! Though not a lot of people want to sign up on the spot, the membership table is a great way to let people know about all the amazing benefits that come with being a member of ABT and every time someone decides to hold on to the brochure it’s a small victory and possibly one step closer to welcoming a new member to the ABT family. Working at the membership table is an important strategy to grow membership, but it’s not all work and no play! I have to be stationed at the table before and after the show and during intermissions, but as long as I duck out of the auditorium as soon as the curtains close I get to watch the show. Most nights company management will have a ticket for whoever is working at the table, but if they don’t there is a massive TV in the Belmont Room where I can watch. Another great part of working at the membership table is that ABT members volunteer to work there as well. They are a wonderful asset because they have tons of firsthand information about what it’s like being a member that they can share with people who have come over to look at the table. It’s also been fun to get to know them! Leading up to the Spring Season I spent a lot of my time entering ticket orders into ABT’s database so it’s been great to be able to match faces to names and spend so much time with them. 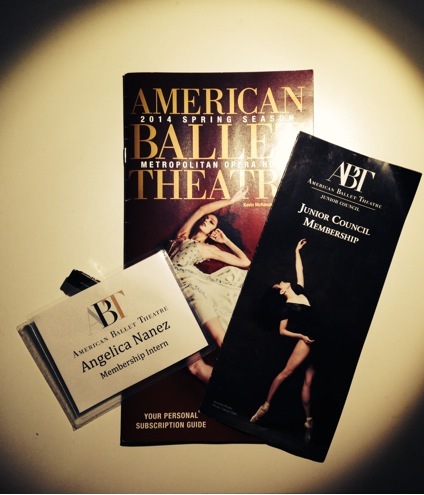 My internship at ABT has been a terrific experience from top to bottom. I could not be more grateful for the wonderful opportunity I have been given and the equally wonderful people that I’ve had the privilege to work for and with. Working at the membership table had been the cherry on top of a perfect semester at American Ballet Theatre.